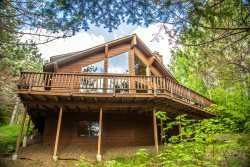 You'll love this "home away from home" on Lake Superior's North Shore! Caribou Highlands 544 is a 3-level ski-in/ski-out end unit townhome located in the Caribou Highlands Resort. The townhome is the ideal getaway for a weekend ski trip or a summertime home base for your northwood explorations. Caribou Highlands 544 has 3 bedrooms, 2.5 bathrooms, and a bright, open living area. The kitchen has been remodeled with granite countertops and new appliances. You'll love curling up in front of the wood fireplace in the winter or grilling up a rack of BBQ ribs on the gas grill in the summer. This unit features a spacious 2-sided deck complete with a picnic table and additional sitting area- perfect for summertime BBQ's. This popular year-round resort features a three-season heated outdoor pool, a year-round indoor pool, hot tub, fitness center, children's play areas, firepits, community BBQ grills, and other amenities. You are just minutes away from many North Shore attractions! This is a ski-in/ski-out unit for the popular Lutsen Mountain Ski Area. This puts the mountain right at your back door. During the summer, the Alpine Slide and Gondola are popular attractions. Superior National at Lutsen Golf Course is just a mile down the road and features a full golf course in the summer and miles of fat bike trails in the winter. At the Caribou Highlands condo you are surrounded by miles of hiking trails and only a short drive to Temperance and Caribou state parks. Grand Marais, with many quaint gift shops and dining options, is just 20 miles up scenic Highway 61. Friendly, quick to reply to concerns/questions. Location was beautiful, easy ski in/out, fireplace was very enjoyable!